This is the latest of several blasts this fall from the scrap metal recycler American Iron and Metal. 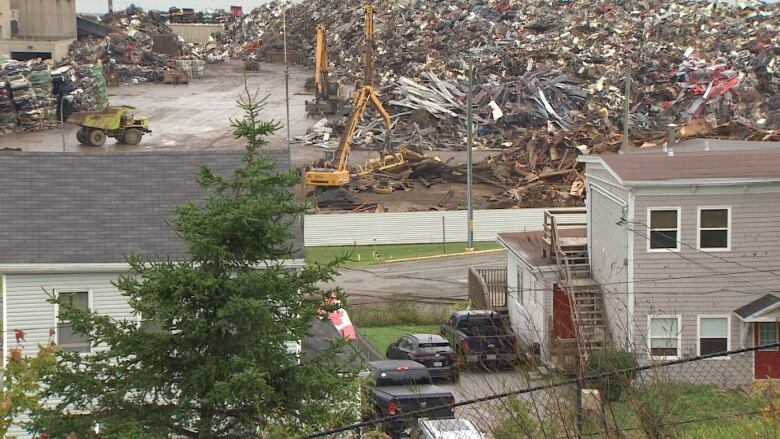 People living on the lower west side of Saint John were shaken by another blast from the American Iron and Metal scrap yard this morning. The blast occurred Saturday morning at the metal recycler's harbour location. A spokesperson for AIM declined to be interviewed, but said they were still working and that there's no risk to the public. CBC News requested an interview with someone from the company, but hasn't received a response. In a post to the City of Saint John's Facebook Page, the Saint John Emergency Measures Organization said they were aware of the situation. "The A.I.M. Facility on the City's lower west side notified the Saint John Fire Department of a loud, contained explosion that occurred in their shredder around 11:20 a.m. this morning," said Saint John EMO. "An emergency response from the City was not required." Saint John mayor Don Darling has also commented on what he calls a "large explosion" on his Twitter feed. "We remain committed to finding solutions to this unacceptable situation," said Darling. Ongoing blasts at the site have raised concerns among local residents. Records from New Brunswick's Department of Environment and Local Government show that between June 1, 2017, and September 2018, there were 36 blasts — small and large — at the waterfront site. Raven Blue, a local resident and organizer of an upcoming meeting to discuss community concerns about the metal recycler, was out of town and didn't hear the most recent blasts. But he said anyone who did should report what they saw and heard to the Department of Environment. He said there have been ongoing issues at the scrap yard for several years. While residents are discomforted by the blasts, he said they have become less frequent in recent months. In his view there are more pressing health concerns such as the possibility of heavy metal contamination in the air and soil. "The air quality [issue] is the most important because it impacts public health on a long term basis," said Blue. Blue also cites the noise generated at the site, separate from occasional blasts. "When a ship comes to load the material, noise continues for 24 hours up to five or six days a week," said Blue.